If Boyd can’t fix it, it cannot be fixed! Let me start from the beginning. I was born in Dallas, and unfortunately for me, I had a father who was an alcoholic. I remember my Dad telling me to fetch a beer out of the refrigerator, and at an early age, he told me to take a sip out of the new cold beer. By the time I was 14 years old, I was drinking and getting drunk with my classmates. By high school, I was drinking regularly with my Wilmer-Hutchins High School buddies. I graduated, and I attended mechanic school for 2 years. I then worked for my mechanic accreditation, which took 4 years. I was a mechanic for a while and got the traveling bug, which lead me to getting my commercial driver’s license. I was driving 18 wheelers coast to coast, but my new job really interfered with my drinking. I started drinking and driving, which weighed on my conscience. I decided to quit truck driving and went back to being a mechanic. At this time, my drinking escalated. I never drank on the job, but before I showed up for work, I would drink to take the edge off. In 1998, I found myself homeless and made my first of many visits to Soul’s Harbor. There really wasn’t much to the substance abuse program at Soul’s Harbor at that time. I could not stay sober. In 2009, when I came back to Soul’s Harbor for the seventh time, I noticed something different—AA meetings with sponsors. I left Soul’s Harbor and got a job. But soon after my 1st paycheck, I was drunk again, holed up in a hotel room and down to my last dollar. I had a choice. Either I spent the dollar and called Brent at Soul’s Harbor or I spent the dollar on beer. Thankfully, I chose to call Soul’s Harbor. They brought me in and required that I get a sponsor and work the Steps. I have been sober since April 2012, and my life is so much better. I have my friends and am truly happy, joyous, and free of alcohol and drugs. This is Brent writing now. Boyd is one of the humblest people in the world. I want to brag about Boyd. His long-term recovery is a great example of the new guy that walks through the doors of Soul’s Harbor. He works harder than anyone at Soul’s Harbor, including me. Besides being the auto mechanic for our 5 trucks and 3 vans, he maintains and fixes our buildings—which many of them are over 60 years old! Boyd is the only person to earn “Resident of the Month” twice at Soul’s Harbor. 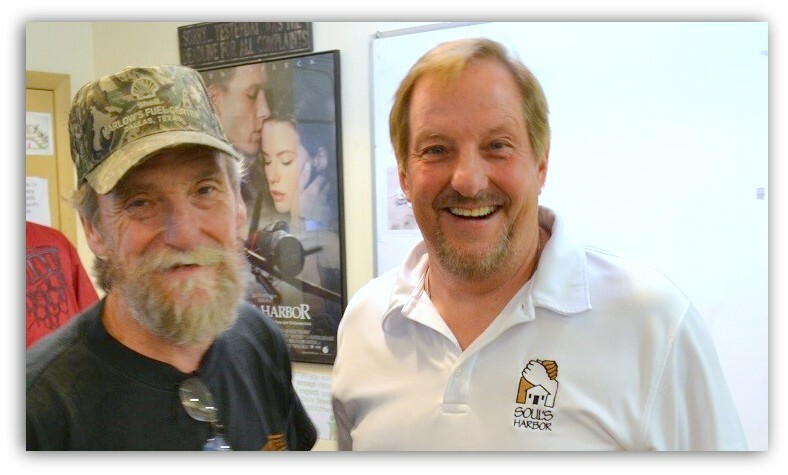 Boyd saves Soul’s Harbor tens of thousands of dollars each year.Thank you, Boyd, for being part of Soul’s Harbor. Thank you, Boyd, for being a special part of Soul’s Harbor. Pictured above is our Assistant Director, Reggie Finch at his high school alma mater – Irving MacArthur. Reggie is to the far right with the black t-shirt. 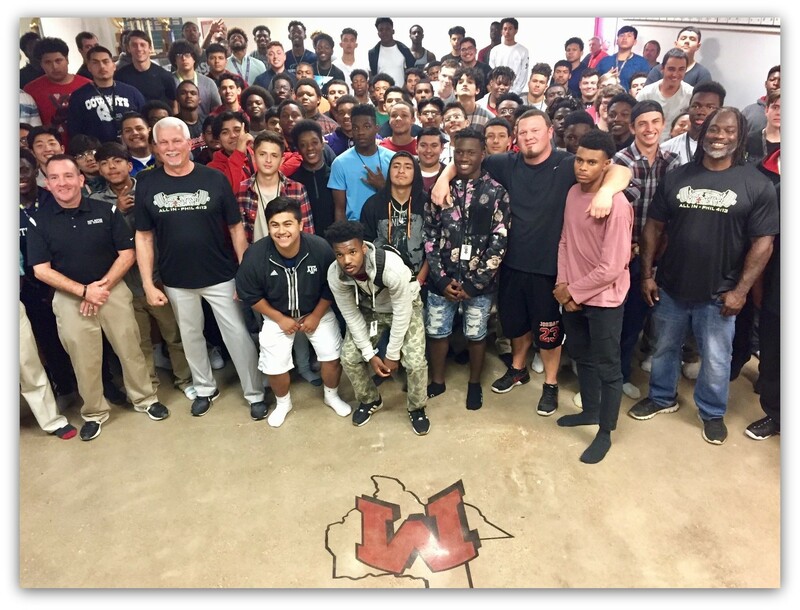 Reggie was there for Rock Bottom Outreach and telling his story to the entire high school football team. Tentatively, Reggie’s story will air on local Fox News on a 15-minute segment called “In the Moment” on Friday, May 12th at 9:30 PM. Reggie told his story back in October of last year – from his high school football days at Irving MacArthur to being recruited by Oklahoma University then being homeless because of his drug addiction and finally his amazing recovery which started 7 years ago at Soul’s Harbor. Thank you, Fox News for telling Reggie’s story. Thank you so much for your financial consideration. Note, your tax-deductible contributions may also be submitted through PayPal to gro.s1555900644allad1555900644robra1555900644hsluo1555900644s@eta1555900644nod1555900644. *Please note: Users of Internet Explorer 8 and above may experience difficulties with our PayPal “Donate” button. Please access PayPal directly to make a financial contribution to Soul’s Harbor, Inc. Thank you!